POMONA, Calif. (Nov. 9, 2018) — The victory Top Fuel pilot Scott Palmer has been chasing all year finally came last weekend at the season finale of the Lucas Oil Drag Boat Racing Series event in Phoenix. 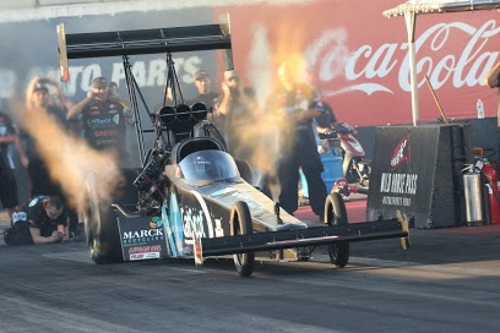 Now he’s hoping his team’s success on the water translates to the concrete and asphalt racetrack of Auto Club Raceway in Pomona, site of this weekend’s 54th annual Auto Club NHRA Finals. Palmer and his main sponsor and friend Tommy Thompson co-own a Top Fuel Hydro boat named Liquid Voodoo, which like Palmer’s dragster, promotes CatSpot Organic Cat Litter. With good friend Kebin Kinsley in the cockpit, Liquid Voodoo blew away the competition at Wild Horse Pass Motorsports Park on numerous occasions. “Our boat set the speed record four times clocking more than 265 mph,” Palmer said. “And that was pretty impressive because the competition is really tough in that series. The two guys running for the championship both ran in the teens (between 3.13-3.19 seconds) and one of them set the E.T. record so it was an historic weekend. Because his own race rig was on hand, Palmer decided to get out his CatSpot Organic Cat Litter Top Fuel dragster and thrill the boat race fans with a special treat. Between the information he gained in Phoenix, the tune-up teammate Dom Lagana used in Charlotte and the info he shares with the CAPCO team, Palmer feels very bullish about his chances in Pomona. “We’ll try to make a really good first run that will secure a spot in the field and then tune from there,” Palmer said. “We’re going to try to win the race. Our teammate Steve Torrence and the CAPCO guys already won the championship and I know they want to win six in a row, which would be historic in itself. But if he can’t win for whatever reason, then we want to take his place.